My messages are being deleted from my iPhone 4S by themselves. Specifically, I sent messages with my girl friend everyday, this month have sent over 300 messages. However, today, I found most of the old messages from my girl friend were missing. I haven’t deleted any of the older ones. These sweet messages are our wonderful memories. I must find them back, is there a way to recover these lost older messages on my iPhone 4S? The first port of call is your phone provider. Some – although not all – will keep a record of your text messages, and you are entitled to access them. It may be as easy as logging in to your account online. For some it requires you to contact customer services. The answer may be no, but it costs nothing to ask, right? This works only if you have backup text messages before they lost. 1. Connect your iPhone to the PC with which you sync it. iTunes should open (if not, open it manually). 2. You should see your iPhone in a box, top righthand corner. Select it. 3. Now choose ‘Restore backup’. Unfortunately, iCloud doesn’t back up SMS in all territories, and for all phone operators. My UK O2-operated iPhone 5 falls into this category. So the following may not work. You’ll need only to go to step 2 to find out if it will work or not. 2. Click on Text Messages (if it isn’t there your messages haven’t been backed up). 5. Turn off Text Messages (or ensure it is turned off). I know this sounds counter intuitive but stay with it. 6. You’ll see a pop-up. Select: ‘Keep on My iPhone’. 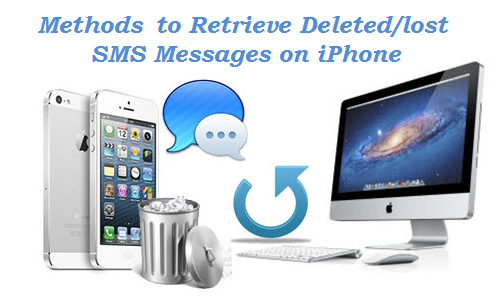 This entry was posted in iPhone, iPhone 4S and tagged find back deleted messages, old messages missing on iPhone, recover deleted messages on iPhone 4S, retrieve lost SMS messages on iPhone by IosdroneD. Bookmark the permalink.